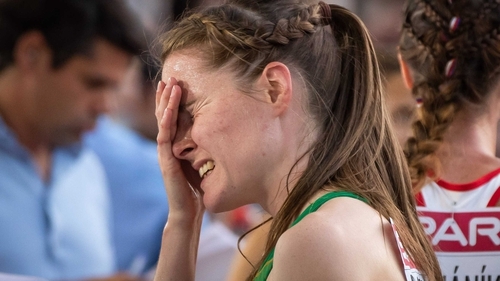 Ciara Mageean couldn't reel in Britain's Laura Weightman to make the podium at the European Championships, as the Portaferry woman took fourth in the 1500m final. Laura Muir set a good pace through the first lap and, with compatriot Weightman, peeled away from the field. Mageean made her move on the bell and was on Weightman's shoulder coming round the last bend but she failed to find the kick she required and Weightman held on. Muir pushed on to take gold ahead of Poland's Sofia Ennaoui. "I'm bitterly disappointed," she told RTÉ Sport afterwards. "I came to try and bring another medal home for Ireland to join Tom [Barr] with some metal work around my neck. "I gave it everything out there and just fell short. It was a tough run. I'm proud to be able to go out there and give everything in the Irish vest." Ireland set a new national record of 43.80 but just missed out on qualification for the women's 4x100m relay final as Gina Akpe-Moses was pipped to third on the line. It left the Irish ninth overall, 0.06 of a second behind the Italians, who took the last spot in the final. Joan Healy made a strong start which Phil Healy maintained on the back straight. Ireland were third when Ciara Neville handed over to Akpe-Moses, who was agonisingly edged out by the Italian Audrey Alloh.